At this very moment, I am floating on a cloud. My body feels almost completely free of tension and is totally relaxed. Why you ask? Well I just got home from a reflexology session and all I can say is HOT DAMN. So what is reflexology? Just a foot massage, right? NO WAY JOSE. 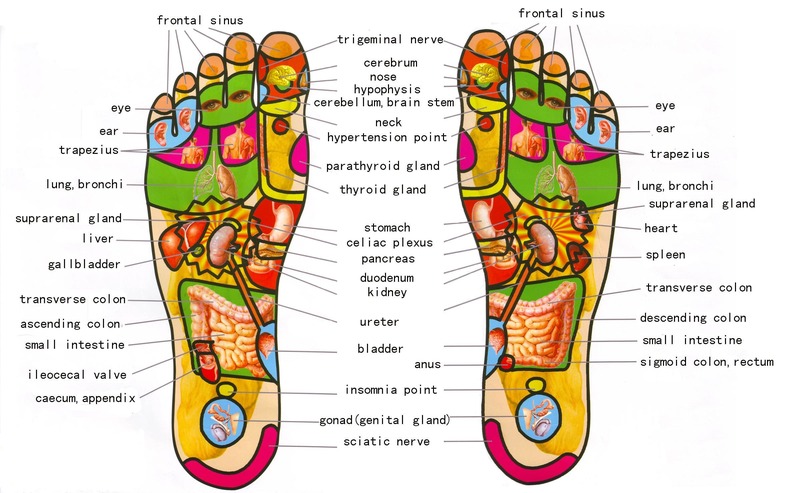 Reflexology is a holistic, healing therapy that involves applying pressure to specific areas in the feet and hands, that affect certain reflex areas of the body. It’s a practice that dates back thousands of years and was first used by the ancient Chinese and Egyptians. To understand how this works, you must accept the fact that everything in your body is truly connected, even beyond our basic understanding of the nervous system. With that being said, practitioners use zone maps, like the one below, applying pressure to each zone which in turn, has immense benefits throughout the body. I need to make one thing painfully clear: THIS IS NOT A RELAXING FOOT MASSAGE. To enjoy the benefits of reflexology, you must indeed endure through the pain. One tip I can offer you is to breathe continuously and deeply through it all. For all of my yogis, ujjayi breathe works magically. It also helps to visualize yourself breathing in and out of the specific area the practitioner is working on. The work that is being done to your feet will make you feel profoundly better than the way you walked in. BET. I’m by no means an expert on this stuff but I can tell you, with confidence, that regular reflexology has been such a powerful tool for me. With a 1 hour reflexology session being only about $40 on average, it’s affordable enough to enjoy on a somewhat regular basis. Hi friends! I’m Alexis. I am an animal lover, yogi, wine loving lady with a passion for experiencing new cultures. This blog will include travel tips, yoga/wellness journals, wine recommendations, and beauty related reviews/posts. Please subscribe to stay connected! Disco Dirty 30 party celebrating our babe @jordan_chelsea !